Today NetApp announced a complete revamping of both the FAS and AFF lines and with it a divergence in model numbers. My favourite improvement is that NetApp has changed the way FlashCache gets delivered; now all FAS platforms can take advantage of FlashCache using an M.2 NVMe device onboard the controller, even the entry-level models; in fact, it’s standard on all models. In the realm of connectivity, both the top-end FAS as well as all AFFs can now offer not only 40GbE but 32Gb FC as well, first to market for both of these. Appears to be the same 2RU enclosure as the FAS2240-2, FAS2552, and DS2246, likely with an upgraded mid-plane. This all-new chassis separates the I/O from the controller so there are no more onboard ports and all I/O is done using PCIe cards, 10 slots per node. 2TB of FlashCache are now part of the standard configuration, upgradeable to 16TB. The FAS2600 comes with 3 times as many cores, twice as much memory and >3 times the NVMEM than that of the FAS2500 and brings 12Gb SAS and 1TB of NVMe FlashCache is expected to perform 200% faster than its predecessor running 8.3.x, making the entry-level line of controllers smoking fast. The 8200 has twice as many cores and four times as much memory as the FAS8040 and also comes with 12Gb SAS and 1TB of FlashCache, making it roughly 50% faster. The new top-end model, the FAS9000 goes modular, decoupling I/O from the controllers. This performance monster which has 2TB of FlashCache standard and 20 PCIe slots for I/O is expected to run 50% faster than the FAS8080 on 8.3.x. A cluster of 24 FAS9000 nodes (12 HA pairs) scales up to as much as 172PB. 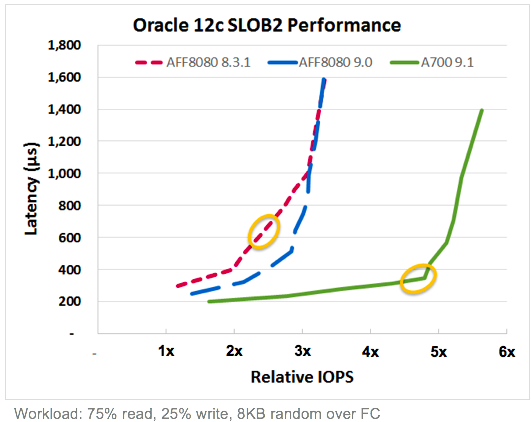 As for the new AFF models, the A300 should get about 50% more throughput than AFF8040 running 8.3.1 while the A700 aims to replace the dual chassis AFF8080, saving four precious rack units but still providing 100% more IOPS, in fact it should be able to handle about double the workload at half the latency. The new lineup, both FAS and AFF are definitely addressing some concerns; FlashCache not only available throughout the FAS line but standard as well is a move in the right direction as is the addition of 12Gb SAS. 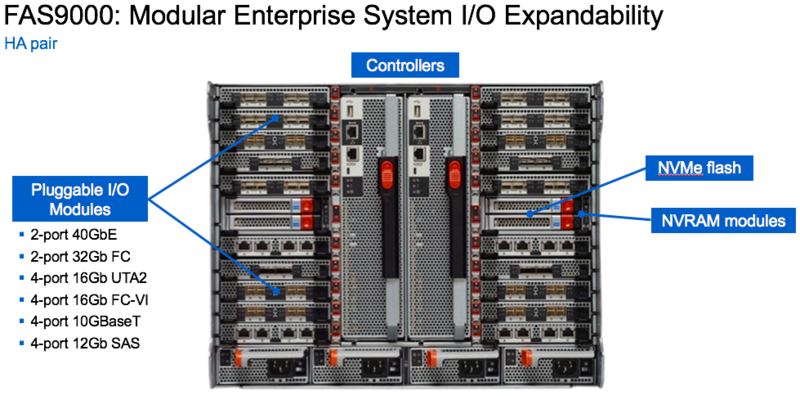 The introduction of both 40GbE and 32Gb FC into the mid-range and upper models of both lines should provide the fire hose required to deliver all that new controller and storage back-end performance. The two new AFF model numbers lead me to believe that they may be leaving room in the middle to add models to the line. While ADP has been around for a while and is a great work around to dedicated root aggregates, I would love to see NetApp move away from root aggregates completely and do something with M.2. I’ll keep my fingers crossed for this one, but won’t hold my breath either. This entry was posted in AFF, FAS, Hardware, NetApp on September 26, 2016 by chrismaki.